If asked to choose what my last meal on earth would be, the answer is simple: macaroni and cheese. However, the likelihood consciously eating a meal knowing all the while that it is my last is highly unlikely, and I hope it remains that way. There are very few circumstances where I would have the opportunity to choose something like that, and the ones that are currently coming to mind involve me committing a despicable crime. 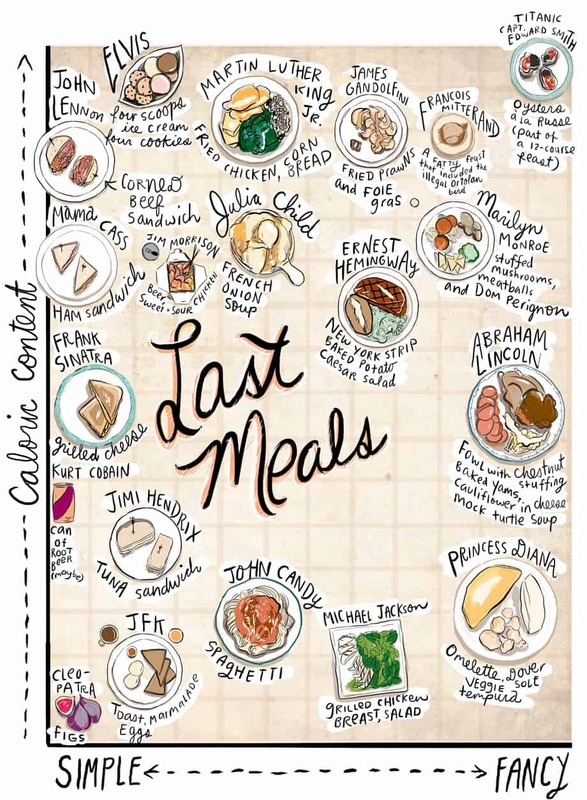 This particular infographic presents last meals in a different way. It shows us what is believed to be the last meal of some of the most iconic laid-to-rest figures sorted by caloric content on a scale of simple to fancy. Weird, right? I like it.